We’d love your help. Let us know what’s wrong with this preview of The Passengers by John Marrs. The passengers are: a TV star, a pregnant young woman, a disabled war hero, an abused wife fleeing her husband, an illegal immigrant, a husband and wife - and parents of two - who Eight self-drive cars set on a collision course. Who lives, who dies? You decide. To ask other readers questions about The Passengers, please sign up. This was so good, I couldn not put this book down. Took one break in between to eat and went straight back reading. Can’t remember the last time i finished a book in one day. John Marrs had me shook! The plot twist in the end, my god. This is the first book that i have read by Mr. Marrs and I’m definitely going to give his other books a try. It’s better if you read The Passengers without knowing what the story is about. I think that it will make it more enjoyable. At least, for me it was. Anyway, This was so good, I couldn not put this book down. Took one break in between to eat and went straight back reading. Can’t remember the last time i finished a book in one day. John Marrs had me shook! There's nothing that makes you question yourself than when your opinions are the polar opposite of others'. In this instance, there are several issues which made this book somewhat mediocre, in my opinion of course. One, did Libby actually need to be in the room with the other jurors? Her presence felt like a big fat deus ex machina utilized to ensure the reader would care about the ensuing events. It was lazy and unimaginative. Two, why mastermind an act of revenge, against the system that not only cheated your family of a fortune but also was complicit in the death of three generations of the same family, when other innocent citizens' lives would be in peril? In addition, why those 8 passengers and what were the criteria for choosing them? More importantly, why did the author choose to eliminate, Bilquis and Shabana, the only POCs in the entire story? Did Marrs not understand the racial undertones surrounding that decision, especially in this Brexit nationalistic period, and considering there were several other white characters who could similarly have been eliminated. Three, why did Noah pretend to be Jude and for that matter, why go through the convoluted process of their initial meeting? It made no sense other than Marrs using that and numerous other coincidences to piece together the fracture within the story. That Libby happened to have witnessed the aforementioned deaths just seemed too convenient. Idk, something about the plot and execution seems convoluted and protracted. Don't misunderstand I thought the premise, of an Orwellian society with driverless cars, was brilliant. Likewise, the motivation for revenge, yet, the act itself was misplaced and unjustifiable IMO. In comparison, consider Marrs' other book The One (which I loved) wherein the motivation and justification for Matthew's revenge was without question. It just made sense and the punishment for Ellie's complicity matched the crime. Ultimately, it was certainly a great premise which was let down by the above issues. However, please do not let this stop you from buying the book as this is no more than the opinion of an outlier. Five billions, need an urgent brain transplant cause my old one is just blown away and out of order stars!!! My head still hurts like I tossed it against the wall thousand times and I started to see cartoon stars on my head as soon as I finish this one! I cannot say I’m speechless because I forgot four languages I’ve known ( including my native one) right now so I’m out of words. This is so revolutionary, innovative, creative book makes you think a lot, thrill a lot and numb your mind! It makes m Five billions, need an urgent brain transplant cause my old one is just blown away and out of order stars!!! This is so revolutionary, innovative, creative book makes you think a lot, thrill a lot and numb your mind! It makes me you question your values, morals. On some parts I felt like a jury member and thought which one was worse? To be a decision maker of someone’s mortality or stuck inside a death trap car when all of your skeletons in the closet reveal one by one. I’m really doubtful that Mr. Marrs is from this planet because he outsmarted most of the genius writers with this book. He is so talented, knows how to deceive the readers with his conspiratorial moves and amazing twists. I liked “ One” a lot but I liked “ Passangers” sooo much more! This is the most surprising, exhilarating book I’ve really enjoyed! It really exhausted me because it was not easy adventure for everyone! Bharath Great review Nilufer. Very interesting! I can't believe I was just able to binge read another 400+ page book in record speed. I recently read John Marrs's The One because I heard it was going to be a Netflix series, so I was very excited to pick up his latest Black Mirror-esque novel, The Passengers . The Passengers takes place in the not so distant future, and autonomous cars are now regulated and compulsory during UK's new plan to try and circumvent human error for fatalities, accidents, pollution, and other traffic related trage I can't believe I was just able to binge read another 400+ page book in record speed. I recently read John Marrs's The One because I heard it was going to be a Netflix series, so I was very excited to pick up his latest Black Mirror-esque novel, The Passengers . The Passengers takes place in the not so distant future, and autonomous cars are now regulated and compulsory during UK's new plan to try and circumvent human error for fatalities, accidents, pollution, and other traffic related tragedies. I'm not going to give too much about this story, because it's fast-paced and you'll need to be surprised as the story develops, but imagine eight people all trapped in their autonomous car with no means to escape. We have a refugee woman, a woman who doesn't speak English and provides for her family, a wife and husband of ten years, a pregnant mother, a young man, a famous legendary actress, and a double amputee army veteran. Each person is trapped, with their routes being taken over by a collective. This collective is here to make a statement—after two and a half hours, one of them will live, while the rest will die in a horrible accident. When the news reaches five influential people tasked to help decide the outcome, people's bigotry, xenophobia, sexism, homophobia, and dark rooted socio-economic opinions start unraveling. I won't go any further on Goodreads with the synopsis on this awesome story, but if you want to know more, let me know privately because I can go on and on about this story all day! I enjoyed the social commentary that Marrs provides in The Passengers , that seems to be lacking in many thrillers that I've seen before. We get hints of ignorance and micro-aggressions from people that we may not have expected, how society shames those that are different (you'll know what I mean when you see the hashtags), and how as a society we still need to change and keep ourselves in check. The Passengers is just light years ahead of it's competition when it comes to social intelligence and the surrounding environment. I hope you'll notice it too. A key aspect that I absolutely loved about The Passengers during the narrative was how shocking it was to see the misfortune of these eight passengers, and how it became a worldwide phenomenon. How would this be something that all of the media, and the people watching it, be tuned into? Then I realized, wait I fell victim too! I couldn't put the book down—I needed to know who was going to live, who was going to die, and how it was going to happen! I'm just as guilty as the portrayal of the spectators in the story. I'm a big fan of John Marrs books and I was delighted to receive an ARC of his new book The Passengers and I was not disappointed. I was hooked from the first page and I did not want to put it down. This thriller is about the dangers of technology. Eight driverless cars have their operation systems hacked and are on a collision course. The passengers are told this and we see their reactions and the reactions of the social media and television audiences. This book kept me on the edge of my seat with I'm a big fan of John Marrs books and I was delighted to receive an ARC of his new book The Passengers and I was not disappointed. This book kept me on the edge of my seat with some great characters and lots of twist and turns. 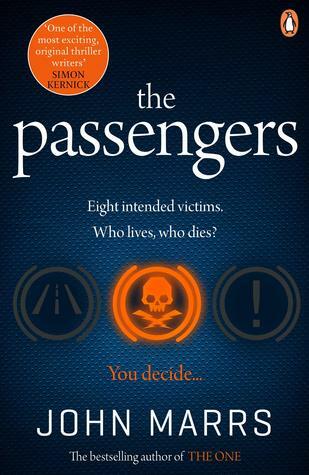 ‘The Passengers’ by John Marrs published 16th May ( please note date ) by Penguin Random House UK Ebury Publishing/Del Rey! I went to a very interesting cyber hacking event this week and I couldn’t help myself, I had to just ask the host about the hacking capabilities of self-driving cars. I was loudly assured that at this point there are no threats…….. but quietly told that it can’t be ruled out in future as hackers evolve with technology. This story is set in the not too distant future where self-driving cars are ubiquitous. Traffic congestion, accidents and pollution has gone down dramatically. New industries and jobs have been built around this revolution in transportation. 8 different people get up on a fateful morning, order their cars and get in to start their day. But they will never reach their destinations. Very quickly they realise that their cars have been taken over by someone else who is hell bent on ensuring that their cars will collide in the next few hours. The governing body that oversees the efficacy of AI technology are contacted by the Hacker, forcing them to choose which passengers live or die. The general public also get involved as footage of the panicked passengers are streamed to social media. A flurry of hashtags are born and the story almost takes on a reality TV feel. This is my second book by John Marrs and I think he will become one of my go-to authors for easy fun reads. I also enjoyed the way that mob mentality on social media was explored and how the secrets of each passenger was revealed. This is one of those books that should be saved for a holiday as you would probably want to read this undisturbed. John Marrs has gone and done it again! A timely technothriller premise and superb execution make this a pleasure to read; I'd even go as far as to say that it's his best thriller to date and that is indeed saying something. From the moment you eagerly consume the first page, you are expertly held in a vice-like grip where putting it down is simply not an option. This is the type of book that will make you read through the night despite having to work in the morning, the type of book that means y John Marrs has gone and done it again! A timely technothriller premise and superb execution make this a pleasure to read; I'd even go as far as to say that it's his best thriller to date and that is indeed saying something. From the moment you eagerly consume the first page, you are expertly held in a vice-like grip where putting it down is simply not an option. This is the type of book that will make you read through the night despite having to work in the morning, the type of book that means you burn your dinner, the type of book that makes you miss your stop on the train. In other words, the very best type of book. It's a long time since I encountered a novel quite as topical and absolutely riveting. Marrs has been one of my favourite writers for many years, but this cements his place even more and shows him at the very top of his game. In fact, this is so good it puts other crime fiction to shame. Now, the twists and turns in The Passengers are plentiful and although I read at least 500 books, most of which are from this genre, I failed to predict exactly what was going to happen, and boy, you have to love it when that happens. There's nothing worse than a predictable thriller now is there? Even though it is heavily based in a future world where technological advances have changed the way we live Marrs masterfully makes it plausible when it could've quite easily have been outrageously improbable. As always, it's well written with a cast of beautifully developed and engaging characters and thrilling from picking up until putting it down. If it doesn't have you on the edge of your seat then please book an appointment with your GP as there is seriously something wrong. A five-star page-turner which is an absolute must-read, and one of the most accomplished, addictive, unsettling and entertaining thrillers I've ever had the pleasure to devour. It will no doubt cement his status in the hearts and minds of long-term fans and gain him many new disciples. As always John Marrs does not disappoint. This time round he introduces is to a world where self-driven vehicles are the norm, although not everyone is convinced that this should be so. Libby, the main protagonist, is one of the few who have doubts about the safety of the vehicles. On her second day on a jury deciding blame in driverless fatal accidents, eight of these cars gets hacked and their passengers informed that they will be dead in a few hours. The above event is televised, and the whol As always John Marrs does not disappoint. This time round he introduces is to a world where self-driven vehicles are the norm, although not everyone is convinced that this should be so. Libby, the main protagonist, is one of the few who have doubts about the safety of the vehicles. On her second day on a jury deciding blame in driverless fatal accidents, eight of these cars gets hacked and their passengers informed that they will be dead in a few hours. The above event is televised, and the whole situation turns into a social media circus. What I enjoy most about this authors books is that he tends to create quite a lot of characters, and then to give them all very different, very interesting backstories. I liked the focus on social media, but felt this book was a bit more far-fetched than some of his others. He has definitely created his own little niche, and his books are perfect for a quick bit of escapism. The Passengers is set in the future, where all cars are driverless. Older models have manual override but the latest, Level 5, are completely autonomous and used with an app. You just programme This book was so gripping; totally plausible (- because we all know how incompetent any Government are at anything to do with transport!!) and absolutely terrifying all at the same time. I am extremely uncomfortable with the idea of autonomous vehicles anyway and this story hasn’t reassured me in any way. Anyone who follows me on Facebook or is a member of THE Book Club knows that I am a HUGE fan of John Marrs and am lucky enough to call him a friend and also honoured to be featured in a cameo role in his last 5 books. When John wrote THE PASSENGERS he kept telling me I wouldn’t enjoy it, but as usual I totally ignored him and started the book with an open mind. If you’ve read any of John Marrs’ previous books then you know you are in for an original story line full of fascinating characters who a Anyone who follows me on Facebook or is a member of THE Book Club knows that I am a HUGE fan of John Marrs and am lucky enough to call him a friend and also honoured to be featured in a cameo role in his last 5 books. When John wrote THE PASSENGERS he kept telling me I wouldn’t enjoy it, but as usual I totally ignored him and started the book with an open mind. 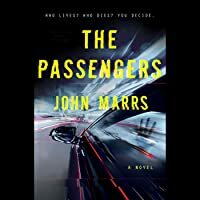 If you’ve read any of John Marrs’ previous books then you know you are in for an original story line full of fascinating characters who all tell their story through their own voices and chapters and somehow are all brought together in a clever and gripping way and THE PASSENGERS does exactly that. THE PASSENGERS is set in the not-too-distant future and is similar in concept to THE ONE which focuses on what happens when technology is taken to the next level and the consequences on the human race. In this book driver-less cars are now the norm and in the level 5 automobiles there isn’t an override option, a steering wheel or even brakes and the passengers rely 100% on technology to take them from A to B. Eight seemingly random and unconnected “Passengers” get into their driver-less cars one morning and within moments their cars are hacked, they are told they will die within 2.5 hours and their fate is streamed live to the world via social media. Meanwhile over in a non-disclosed government building a select group of MP’s, doctors, lawyers and religious representatives are taking part in a top secret jury and inquest. Within moments of the hacker hijacking the cars he has made contact with this group and given them sole responsibility for the deaths of the 8 passengers. Do you want the long version or the short one? For those who don't want to wait for the punchline: put it on your readlist, now! This novel is legit one of the best thrillers I've ever read, it's brilliant, timely and I loved it 100%. If you enjoyed reading The One then it's guaranteed that you'll love The Passengers too. Even though the subject in the novel is completely different, it follows the same format again, involving multiple (8!) characters with alternating POV's. Each person has secret Do you want the long version or the short one? For those who don't want to wait for the punchline: put it on your readlist, now! This novel is legit one of the best thrillers I've ever read, it's brilliant, timely and I loved it 100%. If you enjoyed reading The One then it's guaranteed that you'll love The Passengers too. Even though the subject in the novel is completely different, it follows the same format again, involving multiple (8!) characters with alternating POV's. Each person has secrets to hide, secrets you'd never EVER thought of and will catch you completely off guard! I have to be honest, I was completely pro the idea of driverless cars. You see, I don't have a driver's license myself so the thought of a stress-free ride where you don't have to navigate yourself (there's not even a steering wheel in level 5 cars so you have all the time in the world to eat breakfast, apply makeup or, oh yes, read a book) sounded more than wonderful but what happens to The Passengers was anything but stress-free. There's a hacker who controls the cars and don't think he doesn't mean it! If I had any doubts in the first minutes it becomes clear right away that he is dead serious! The entire novel is high on tension and plays on the reader's moral compass. Who would you choose to survive a collision? The pregnant woman? The police woman with two children? The foreign woman who doesn't speak English? Marrs plays this so well, he even adds the opinions of jurors and those on social media as well, leaving us even more hesistant to pledge our loyalty to one specific person. And then, just when you've almost decided he shuffles the deck of cards and secrets come out that might change your thoughts, again and again... The people I felt most loyal to suddenly find themselves ranked quite differently when I had to consider which secret was the worst to have. Marrs really doesn't let up until the end, he always seems to have another twist up his sleeve. I don't know how he can be so imaginative but I really fell from one surprise into another and even when I thought it was finally all over, there was still more to come. Brandice I can’t wait to read this one! Wonderful review, Ingstje! It’s the age of the driverless car. Eight passengers, completely different from each, other go on a journey in their day to day lives. When the cars are hacked and suddenly their journeys are changed and they are told by the hacker, that they are on a collision course to their deaths. Meanwhile in a secret facility, a jury and a group of MPs’ are attending a inquest. When, The Hacker gets in contact with them and gives them the power to decide who lives and who dies. Also, Social media get involv It’s the age of the driverless car. Eight passengers, completely different from each, other go on a journey in their day to day lives. When the cars are hacked and suddenly their journeys are changed and they are told by the hacker, that they are on a collision course to their deaths. Meanwhile in a secret facility, a jury and a group of MPs’ are attending a inquest. When, The Hacker gets in contact with them and gives them the power to decide who lives and who dies. Also, Social media get involved and then the media. The hacker like with social media, we find out a fraction of what goes on in each passengers’ lives, to determine which one of the passengers should survive. I must confess this is the first John Marrs book I have read. I do own a copy of The One but not around to reading it yet and I know how highly John Marrs is recognised for work. I really like this book not just because of the originality and the gripping storyline. But because of the ethics and morality behind this book. How well really do we know people that are famous which can be celebrity or government or just come into the public eye for something they have done and that we only see part of their lives. How can we decide if they live or die in that small bit of information? How do we as a person like to be perceived? I think when this book comes out it will be one of them books that people will talk about for some time. The only quibble I have with this book Part three of the book seems a bit farfetched. So, in that case I give this book 4.5 stars. John Marrs has done it again and we think this may just be our favourite book by this Author to date. Wow…just wow! Honestly, if you haven’t picked up a book by this magnificent Author yet, you are doing yourself a disservice. Not only is John Marrs a master of the written word, but he is also a master of character development, storyline twists, suspense, relevance, intelligent writing and the gift of creating something inherently unique. John Marrs has mastered the art of compelling his readers by sucking them into his world, turning something conceivably possible into reality whilst fictionalising concepts that on the whole aren’t entirely unrealistic. Whilst creating a thrilling tale, he drops in current mainstream subjects, baring naked souls in a magnifying mirror which highlights the imperfections in humanity as well as the importance of issues close to every single one of us. We want to give a standing ovation to John Marrs for writing a fast-paced story of intensity, thrilling intrigue and suspense with a focus on human behaviour and the consequences of innovative greed and corruption. On a ‘regular’ day eight individuals get into a self-drive car, which has now become the chosen and imposed way to commute, promoting safety as well as reducing congestion. Two of these people are sadly caught up in a horrific web of vengeance, whereas the other six have been chosen for reasons known only by the man dubbed, ‘The Hacker’. John Marrs skilfully introduces us to the six passengers, and in a few chapters, he ensures that we have a connection, an opinion and an emotional connection to each and every one of them. However, as with everything in life, we either see what we want to see or what we’re led to believe through what is cunningly portrayed. How well do you truly know someone from the persona that they’ve chosen to portray? Not only that, how many can hold a hand up and say they haven’t experienced regrets of actions or words in their past? Magnify this with the additional curse of social media and the ease of one clicking online hiding behind a screen. Six people on way to a grand crescendo of inevitable death, each having to face their own truth and the judgement of the world that is watching online. Another group of individuals in charge of the harrowing decision forced upon them of who lives, whilst listening and watching the tragedy play out before their eyes through a direct live connection to every single car. A world watching, tweeting and voicing their opinions through hashtags; it’s a voyeuristic train crash of compulsion. The Hacker is the master puppeteer who forces truths and the unmasking of his passengers. What are the motives and why have these passengers been handpicked? What is the influence of social media and how much weight does it hold? At times we felt we were reading a truth, a compelling insight into the world we live in today with a somewhat advanced spin from which we couldn’t look away. We cannot stress how much we love John Marrs. He has written some of our favourite books and when we need that suspenseful thrill, the psychological drama and the relevance of humanity today, we know he will deliver every single time. Once again, through his fiction, John Marrs shines a spotlight on social issues today; the pitfalls of social media, mob mentality and standing in judgement with limited knowledge. His writing is outstanding, his characters have such depth and his storylines are addictive. An added bonus was a reference to the first book we read by this Author, The One. We didn’t move, we skipped breaths and we once again sat in compelled astonishment at just how bloody amazing John Marrs truly is! In the not too distant future a new wave of autonomous vehicles has been approved by the government with the assurance they will minimise fatalities on our roads. Perhaps a touch ironic considering eight Passengers have just been informed they are going to die after being held hostage by their own driverless cars. With The Passe In the not too distant future a new wave of autonomous vehicles has been approved by the government with the assurance they will minimise fatalities on our roads. Perhaps a touch ironic considering eight Passengers have just been informed they are going to die after being held hostage by their own driverless cars. With The Passengers’ rerouted and their phone signals jammed, their terror is a macabre spectacle being streamed live, via an uncensored video feed. The reality of just how insanely powerless and desperately alone they are increases with every page turn, especially after learning their fate will be decided by complete strangers. How can anyone determine whose life is worth more, or is worthless? Well, things get ugly real quick and there are some mammoth shockers. The Passengers will cause every reader’s moral compass to lose all sense of direction until they arrive at their final destination. To some this whole scenario may sound fantastically far-fetched, or perhaps it will feel a little too close for comfort. Whatever your conclusion this author sows the seed of future nightmares, especially when the cause of our fear is unnervingly plausible. Whip-cracking retorts and a chillingly exhilarating ride made it immensely difficult for me to put this one down. LOVED IT. They are given a chance to interview each person to make an informed decision, Libby though, knows one of the Passengers….Jude An inquest is being held to determine who is at fault during accidents with driverless cars…..the car or the human…a jury watches videos of accidents and makes decisions on quite basic information….the car is usually exonerated. Its been a few days since I finished this book, and I still haven’t wrapped my head around the chain of events. ‘The Passengers’ is an intense, fast-paced, bone-chilling, conflicting and an outstanding modern-day thriller that takes us through the darker, more dangerous side of innovation and how humans wouldn’t mind playing ‘God’ now and then. 8 passengers who are supposed to die in the next 2 hours, an enthusiastic audience, and a bunch of lawmakers/judges are what comprises this story. The use Its been a few days since I finished this book, and I still haven’t wrapped my head around the chain of events. ‘The Passengers’ is an intense, fast-paced, bone-chilling, conflicting and an outstanding modern-day thriller that takes us through the darker, more dangerous side of innovation and how humans wouldn’t mind playing ‘God’ now and then. 8 passengers who are supposed to die in the next 2 hours, an enthusiastic audience, and a bunch of lawmakers/judges are what comprises this story. The use of tactics and logic has been brilliantly done, which makes this thriller gripping right from the start. What astonished me the most is the author’s ability to keep the audience engaged to one storyline, all the while plotting a marvelous twist to the tale. I am well aware that during the course of a year I will write at least 30 reviews that say this is my favorite book of the year. And yes, THIS is my favorite book of the year so far! This book is so awesome it makes me wants to cartwheel along the street. Driver less cars are all the rage, roads are less congested, they are safer. Right? I mean the government are pushing them on people with buy back schemes on there manual drive cars. It's a no brainer right? But what happens when someone hacks i I am well aware that during the course of a year I will write at least 30 reviews that say this is my favorite book of the year. And yes, THIS is my favorite book of the year so far! But what happens when someone hacks into the artificial intelligence that runs a driver less car? What happens when 8 passengers have their vehicles taken over and are told that 7 of them will die in less than three hours in a collision? What happens when it's all broadcast live on social media and the public are asked to vote on which passenger they would like to save? John Marrs will tell you!!!! From the first chapter I loved this and it's so topical right now! This book could forever scar me from artificial intelligence! Brilliant. I shall be reviewing on the official tour later this year. Wow, wow, wow, wow, wow! Sometimes a book comes along and literally blows your socks off and The Passengers is one of them. My heart is still pounding just thinking about this brilliantly twisted novel. This is one author whose books just go from strength to strength. Each one gets more gripping and shocking. What I love is how in a couple of his books now, he centres the story around something futuristic that really could happen. It is seriously scary stuff. There are so many twists and turns in Wow, wow, wow, wow, wow! Sometimes a book comes along and literally blows your socks off and The Passengers is one of them. My heart is still pounding just thinking about this brilliantly twisted novel. There are so many twists and turns in this book that I didn’t see coming. A couple were definitely jaw dropping moments. What does make for sombre reading though is how judgemental as a nation we are. Its really hard to say too much about this story without giving spoilers away but it has definitely made me more aware to get all the facts before jumping to a decision. The Passengers is just a brilliant story and concept. I absolutely loved it. It really is an edge of your seat read that will have you clinging on for dear life. One particular part made my heart stop with the mounting tension. It seriously messed with my mind and I thoroughly enjoyed every minute of it. An absolute must read for 2019. We also have the participation of the public via social media, with voting and liking of various passengers. There is a secret operator behind the whole set up and no one kno This is a thriller with a sci-fi feel to it.